I can’t decide if Modern Family was showing its age last night or its writers were. Did you happen to watch? All the jokes were either racist or homophobic… but after each zinger, one of the characters would say, “That’s racist”… so does that make it okay? Ironically enough, in one storyline, Jay and Gloria were both feeling their age as the oldest parents in baby Joe’s daycare class. Sadly, the whole show felt past its freshness date. Do you remember the television series Ed? It was on NBC 2000-2004. Tom Cavanagh played Ed, a lawyer that returns to his hometown after a bad divorce to run a bowling alley. Julie Bowen (Modern Family) was his new love interest, comedian Michael Ian Black played a coworker and Justin Long a local high school kid. It had the charm and quirkiness of Gilmore Girls, and I loved it. I’ve wondered through the years why it wasn’t syndicated on some cable channel. Ed is coming to the UP network weekdays on January 10th! I watched the cast of Modern Family play “Modern Family Feud’ on Jimmy Kimmel Live this morning. The Pritchetts — Mitchell, Jay and Claire — defeated the In-laws — Phil, Cameron and Gloria — but the sides sometimes forgot to be competitive and shared answers across the aisle. 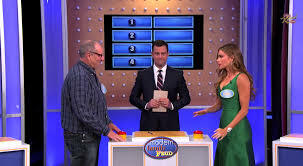 I realized about 10 minutes into the game that it was the first time I have watched Family Feud in almost 15 years. My dog Rory hated the bells and buzzer they use for “survey says!’ so I could never watch. But now my little old man is deaf and didn’t even notice. A child with perspective. I hate that. Thirty-two couples are vying for the title, and Ben and Leslie aren’t even being considered. Thank goodness Lil’ Sebastian isn’t alive to see this day. Since the obvious winner isn’t allowed to compete, I want to make sure some good couples make it into the round of Sweet 16. I’m sure you have your favorites, so vote today! When I first heard that this movie remake was coming to television — and that Ron Howard was attached — I was pretty excited. Visions of ‘Arrested Development’ started swirling in my brain. Then you guys had a bad break when actress Maura Tierney became ill, and you were forced to re-cast and delay the series to mid-season. Now you are the ‘other family show;’ the brilliant “Modern Family” has already captured the imagination and allegiance of the American audience and the critics. Admittedly, you have started in a hole. But now your writers are digging you an even deeper one. With all the talent you have in place — Lauren Graham, Craig T. Nelson, Peter Krause, Monica Potter and Dax Shepherd — you are wasting them on tired storylines and family conflict we have seen time and time again. Sure, a diagnosis of Asperger’s is unique to network television, but your treatment of the issue isn’t. Your actors are better than this. And if you loosen the reins a bit, I’ll bet your writers are, too. Your parents are watching. Make them proud.